We always look forward to the summer and fishing with Ken. Thanks again Ken & I will see you in early July! “Here’s a photo of our first “afternoon” adventure…we lost count of how many 20 pounders we released this first afternoon, unbelievable fishing. 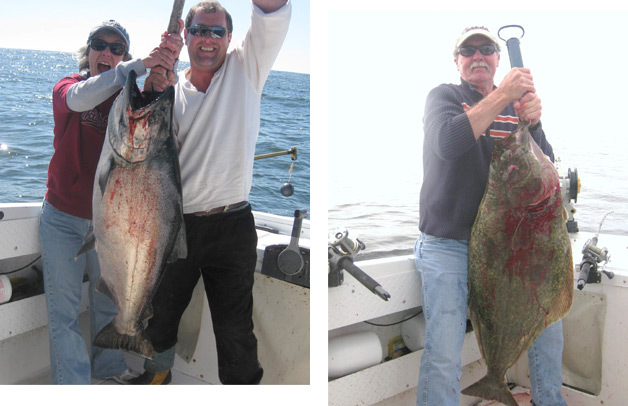 The big fish on the left is 35lbs. 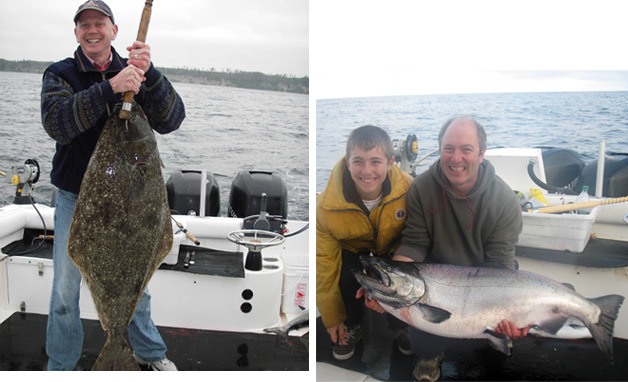 Also is a picture of Dad with his 35lb salmon, I now have orders to ensure we let him know if any trips are in the works as he is wanting to come back again…I will send another pic of the 65lb halibut we caught the same day. 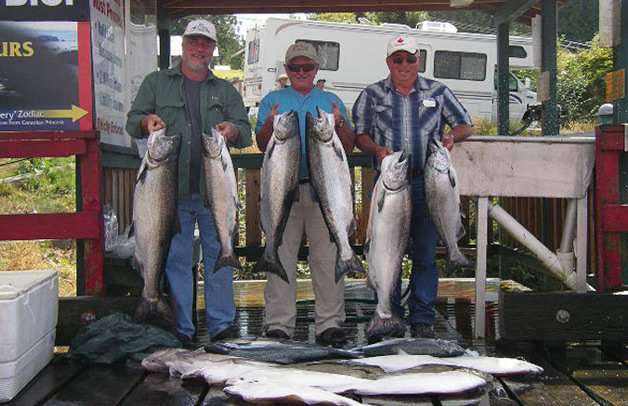 “We have been fishing with Ken for 10 years now and we always plan our 10 to 12 day trip from Oklahoma to the island around a fishing experience with the Myster. And you can be sure it will be an experience. We always get great fish and usually limit out. See attached photos as proof. Di caught a 49lb 4oz salmon (won two K in the derby) and I attribute all the catches to Ken (I won’t reveal his secrets but he knows the drill). The trips are very entertaining and Ken can be serious or funky upon request. His old boat was great but we chummed the fish a time or two when the swells were high. The new boat cuts the swells and can get you from point A to point B in short order. “I am happy to vouch for you and your services anytime. We really enjoyed every trip we made with you. I was in the business for close to 30 years and know a good guide when I find one. That’s why we always tried to book you every time we went to Ucluelet. 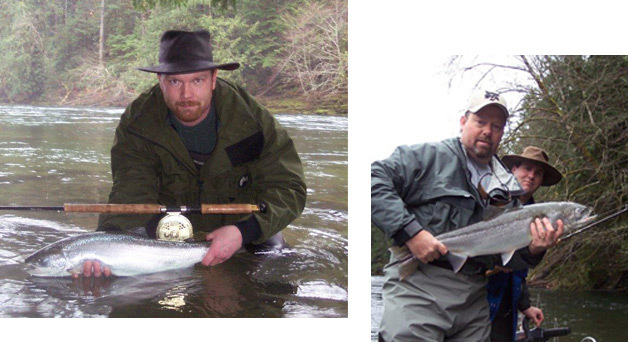 Your knowledge of the area is incredible and you handle fish better than anyone I have ever seen. If you ever need a reference feel free to use my name whenever you like. 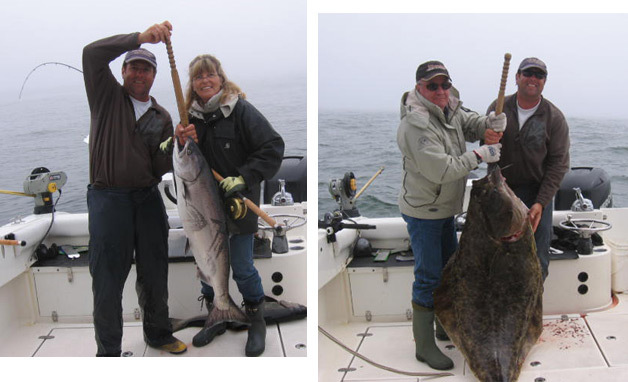 “We went on a family fish trip with the fishmyster in late May of 2012. My two brothers and a nephew took our Dad (and Grandfather)on a 3 day trip with Ken, we had a great time. Ken did an excellent job making sure Dad (who is 83 years old) was comfortable and warm. When Dad caught a fish Ken was right there to help him with the fish and we could get some great photos. Ken’s boat was much more than what we expected. It was fast, comfortable, and very fisherman friendly. All other equipment (rods,reels,etc.) were all top notch. 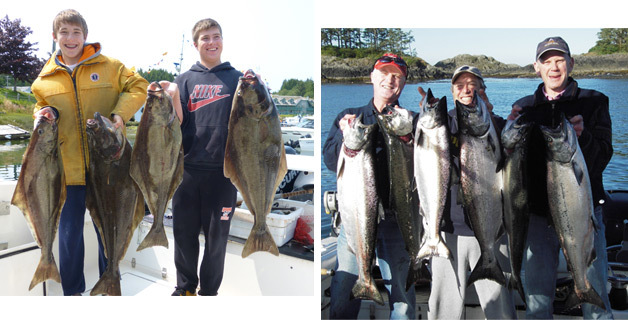 On any fishing trip the weather and the fish are two things you cannot control, but with Ken’s boat and knowledge of the ocean neither was a problem. 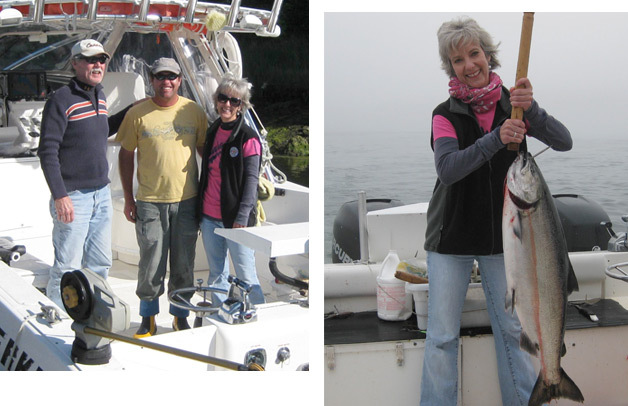 We always were comfortable and caught lots of nice salmon, halibut, rock bass and cod. We even had time to check his crab traps, and dig for clams, oysters and mussels. Needless to say we had some great suppers. 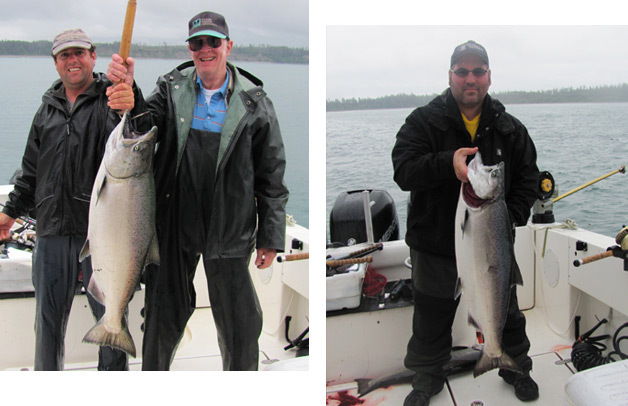 “Fishing with Ken and Fishmyster is as good as it gets! 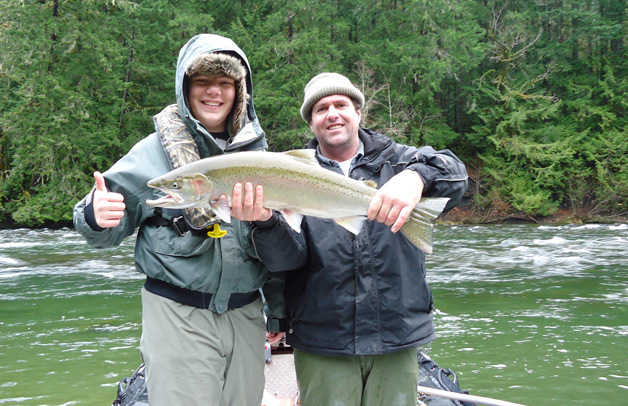 “Well Ken I would love it if this picture of my son Kyle and you with his very first steelhead would make your website. My son still talks about the jetboat ride up and down the river,also how much fun you made it for him as well. He still cant believe how well you know the river and are able to put us on so many fish. My sons exact words were ( he knows that freakin river so well he could probably do it with his eyes closed) and I said YUP he probably could.